Our Hand Fans are produced from 18 pt. cover stock which are then glued onto a wooden handle/stick. When you have decided on a standard fan there are a variety of shapes to choose from. The size of the shapes range from 7 1/4"x 7 1/4" to 8"x8" to 5 1/2"x9". The available shapes are as follows: Hour Glass fn100, Balloon/ Light Bulb fn102, Square fn104, Octagon fn108, Triangle fn110, No. 1 fn112, Heart fn128, Cowboy Hat fn134, Football Helmet fn136, Phone fn114, Circle fn116, House fn118, Church/Star fn120, Palm Leaf fn122, Seashell fn124, Oval/Football fn126, Flag fn144, Truck fn146, Bread Slice fn148, Rectangle fn150, Shield fn152, elephant FN130, Donkey FN132, energy bulb FN154, Barn FN156 & Apple FN158. 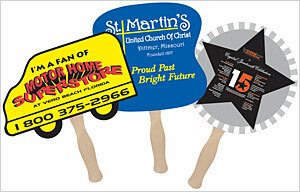 For custom shapes, see custom fans or call customer service.